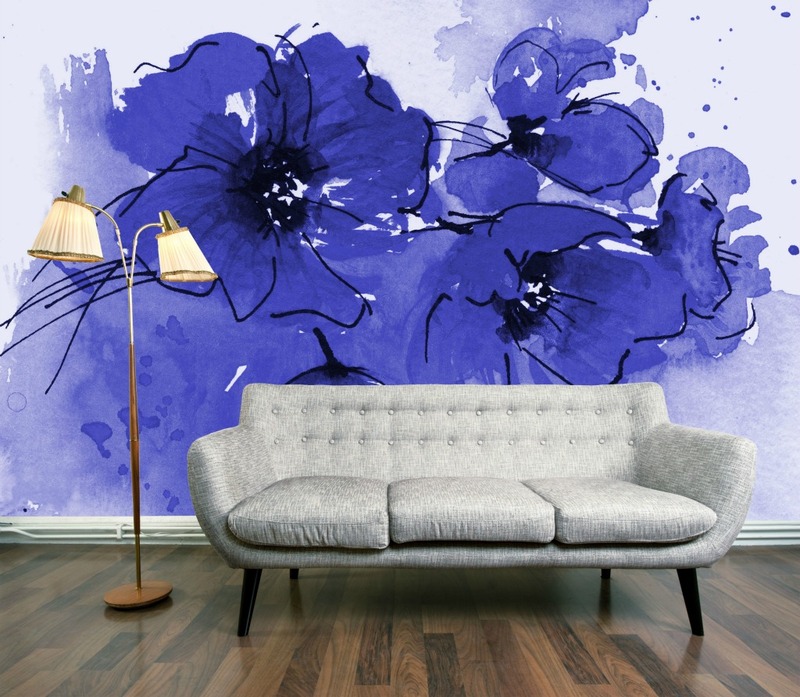 Indigo is the new hot colour for the coming Autumn season so for today’s Wallpaper Wednesday I’ve chosen this amazing Indigo Poppies wallpaper mural from DigetexHome.co.uk. What is a Wallpaper Mural? If you’re not familiar with a wallpaper mural and how it differs from ordinary wallpaper let me explain. A wall mural will often fit a particular sized wall. For example Indigo Poppies is around 4 metres x 2.5 metres and comes in 6 pieces. At some sites you can create your own bespoke mural by adding in the dimensions of the space you want to fill jsut as I did for this mural review last year. The mural is then created for you. This option can be a little more expensive of course. So whereas with wallpaper you can buy as many rolls as you need or like, with a wall mural you tend to fill a certain space, usually a statement wall with the exact image. Indigo Poppies wallpaper mural definitely creates a statement that’s for sure. I find the indigo tones very uplifting and fresh, and think it’s a great fun and contemporary piece. It’s bold and bright so not one for the fainthearted, but use it wisely in a larger room as a focal point. Keep the decor and accessories on trend and contemporary, although I think you could get away with a very eclectic, or even retro look with this if you wanted to. DigetexHome.com also has co-ordinating accessories if you want to explore that option. Available from the digetexHome.co.uk website costing £129. What do you think? Could you be this bold with a wallpaper mural? Blimey! I would grow bored I think but it certainly would be an initial WOW! Wow, thats colorful. You took a big risk on that mural but it paid off nicely. It really fits the room.